To put it in simple words, passive smoking is breathing in other people's tobacco smoke. This is made up of "sidestream" smoke from the burning tip of the cigarette, and "mainstream" smoke that has been inhaled and then exhaled by the smoker. Tobacco smoke contains over 4000 chemicals in the form of particles and gases. It has been estimated that tobacco smoke contains as many as 60 substances which cause or are suspected of causing cancer. Breathing in other people's smoke can cause eye irritation, headache, cough, sore throat, dizziness and nausea. Just 30 minutes exposure can be enough to reduce blood flow through the heart. Non-smokers, who are exposed to passive smoking, have increased risk of heart disease and lung cancer. Second-hand smoke is sometimes referred to as environmental tobacco smoke. It is a combination of the smoke exhaled by a smoker and the smoke that comes from the end of a burning cigarette or cigar. 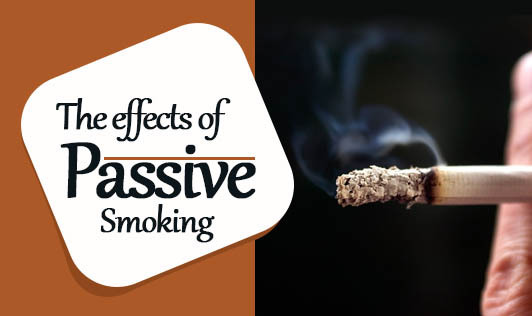 When someone breathes in this smoke, it is often referred to as passive smoking. Passive smoking substantially increases a person's risk of getting coronary heart disease. You may ask how the risks of passive smoking seem so excessive given that a non-smoker doesn't breathe in anywhere near as much tobacco smoke as a smoker. Smoke that burns off the end of a cigarette (called sidestream smoke) may be more toxic than the mainstream smoke a smoker would inhale. What we know is that, for a non-smoker (as well as for a smoker! ), breathing in second-hand tobacco smoke still carries significant health risks. There is no known safe level of exposure to passive smoking.